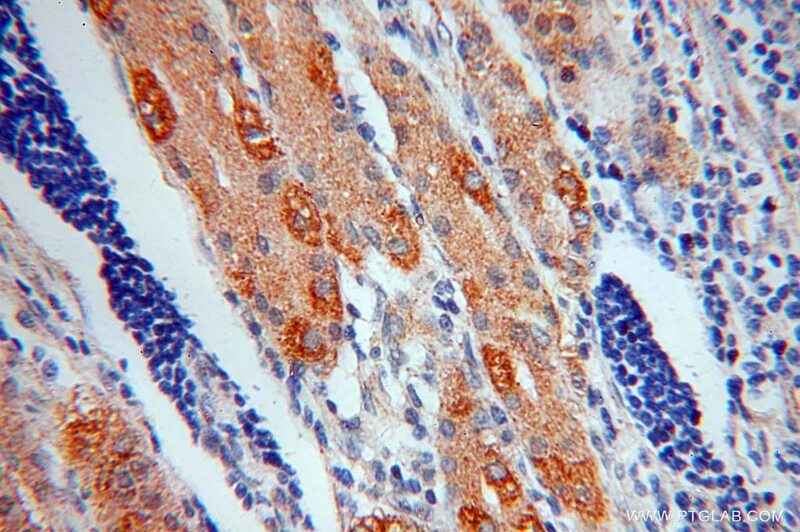 Immunofluorescent analysis of MCF-7 cells, using SYNJ2BP antibody 15666-1-AP at 1:25 dilution and Rhodamine-labeled goat anti-rabbit IgG (red). 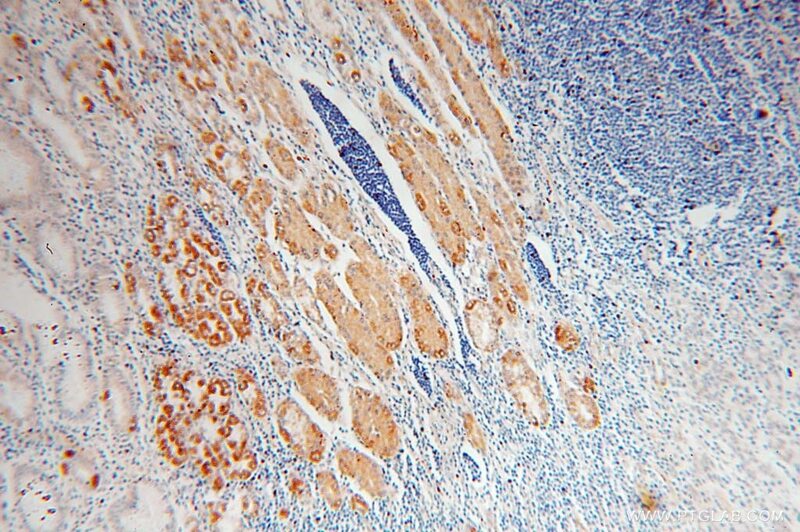 IP Result of anti-SYNJ2BP (IP:15666-1-AP, 3ug; Detection:15666-1-AP 1:500) with mouse lung tissue lysate 4000ug. Activin, a member of the TGF-beta superfamily, plays important roles in reproductive tissues as a stimulator of follicle-stimulating hormone (FSH) secretion and inhibits the proliferation of breast cancer cells. 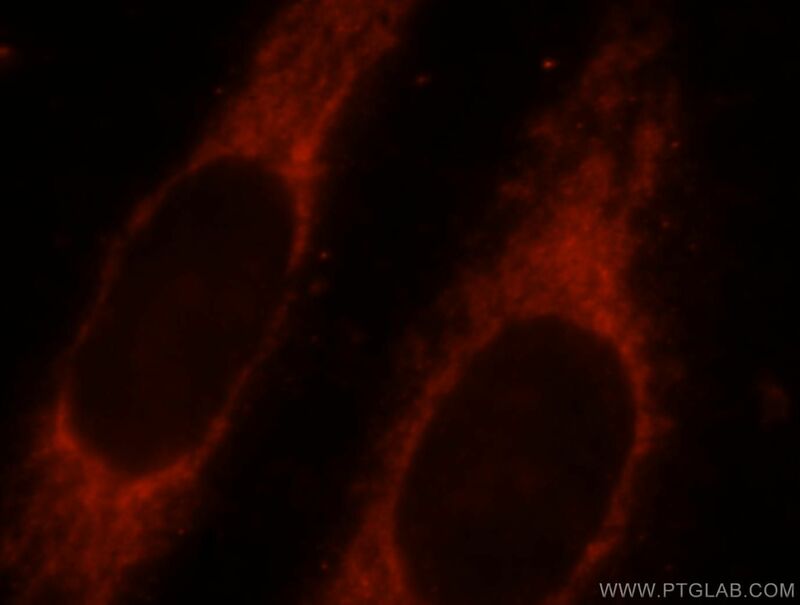 Activin receptor-interacting protein 2 (ARIP2), also known as synaptojanin-2-binding protein (SYNJ2BP), is located in the outer membrane of mitochondria. ARIP2 is widely distributed in various human tissues, and has been recently identified in mouse tissues as a regulatory protein of activin signal transduction by interacting with activin type II receptors. ARIP2 may be a putative growth-promoting factor involved in breast tumorigenesis and tumor development. A double band of size 15.9 kDa can be detected in Western blot (PMID: 23284606). SYNJ2BP promotes the degradation of PTEN through the lysosome-pathway and enhances breast tumor metastasis via PI3K/AKT/SNAI1 signaling.